That's the message of a new sign that went up outside a train station in northern England on Monday. The goal is to stop departing passengers from pulling up in their cars at a crowded drop-off point and pausing to kiss each other farewell. 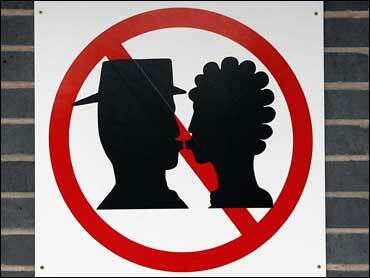 The sign shows a profile of a couple kissing, with a diagonal red line across their image. Virgin Rail says it installed the sign while refurbishing the station after a local business networking group said the place had to become more efficient. But profit margins may have been a factor, too. Virgin Rail says that if passengers want to share an embrace before they part company, they should pay to park their cars nearby where they can kiss all they want.